The potential role of social networks in election campaigns was first understood by the staff of US President Barack Obama in the 2009 elections, but they have proven their mobilizing force also in Romania in this year’s presidential race, after which Mr. Klaus Iohannis became not only the first man in state, but also the first political leader in Europe that exceed the threshold of 1 million Facebook fans. 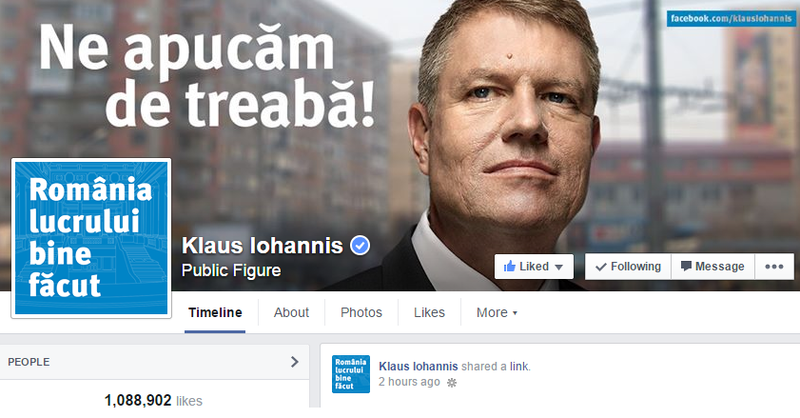 The spectacular growth registered by his Facebook page (klausiohannis) was based on a highly effective communication strategy that understood very well the target audiences and used the appropriate elements through which true interaction was achieved, leading to the creation of emotional and intellectual connections between Mr. Iohannis and his fans. For further details about the growth of Mr. Iohannis’s Facebook page, in comparison to that of his former rival, Prime Minister Victor Ponta (victor.ponta), Alexandru Negrea provides an interesting analysis on his blog (Romanian). Also, more details about the online campaign strategy for Mr. Iohannis you can find in an interview with Mr. Vlad Tăuşance, the coordinator of his online communication during this period. In addition, to fully understand the role of social media in this election campaign, a Zelist company analysis provides an image that speaks for itself. The huge volume of content was created by the candidates and by all other Internet users who have posted messages in connection with the presidential election. Another surprising fact that emerges from this picture is that Twitter was by far the most active social network among Internet users that have generated conversations on this topic, although Facebook was the queen- network during the time frame 1-19 November 2014. Going back, at this moment, the Facebook page of Mr. Iohannis clearly surpasses the ones of all political leaders in Romania, but also of everyone else at European level. But for those who are active on other networks as well, Mr. Iohannis can be followed also on Twitter (@KlausIohannis), Google+ (Johannis) or YouTube (KlausIohannis) , although the activity on these networks is significantly lower compared to Facebook. And because we monitor online communication not only from an internal perspective, since social networks have an important role in foreign policy as well, digital diplomacy being for some time now a key element of bilateral or multilateral relations, we present on our Twitter account @DigiDiploRO a collection of the main messages tweeted by international leaders, through which they congratulate @KlausIohannis or mention his victory in the elections. 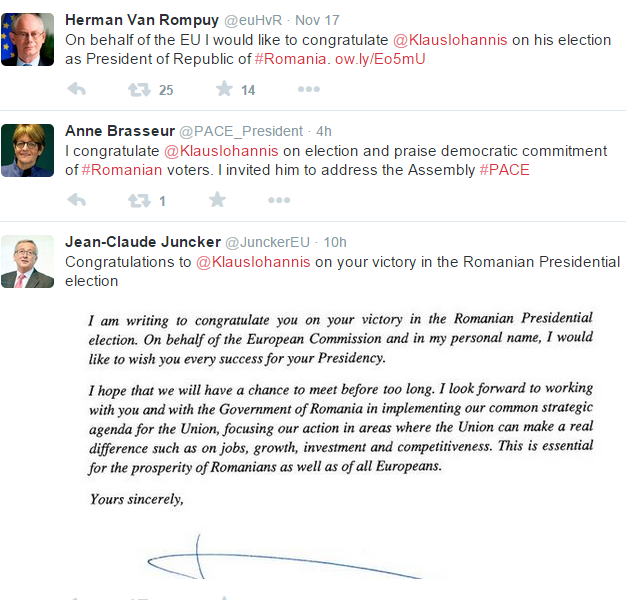 Hence, we congratulate President-elect Klaus Iohannis and his campaign team and we hope that he will continue this type of communication once he takes office from Mr Traian Basescu at the end of December, and that he will become a role model for all political leaders and all public institutions in Romania. Brandon Marc Higa wears multiple hats in his community. In addition to attending the University of Hawaii at Mānoa William S. Richardson School of Law, Higa works full-time as director for Resource Development, is a model and actor, and plays the clarinet in the Royal Hawaiian Band—and in his free time, he is an avid swimmer. Whether in his role as director, law student, or pursuing his love of the arts, Higa’s strong community involvement, both personally and professionally, has proven itself to advance the lives of others. Higa decided to enroll in law school as he wanted to strengthen his advocacy skills and take advantage of this new knowledge to further his commitment to public service. Soon after finishing his 1L year, he was appointed by Hawaii’s governor, David Y. Ige, to serve a two-year term on the University of Hawaii Board of Regents. In his role as Student Regent, Higa advocated for the university’s over 50,0..